I cannot wait to bring it home and set it up to my next to my Free-Westinghouse from the early 1900’s. I feel like my 2008 Brother will stick out like a sore thumb, but it still runs and I use it quite a bit, so I should probably avoid making it feel like an outcast. It’s actually kind of sad to see my Brother, which is only 5 years old, show signs of wear on it, while my Free Westinghouse machine is in great shape. I’ve noticed over the past couple of months, that my Brother is getting slower, and bounces more, and is a little louder. I’ve cleaned and oiled, but it can only do so much. The metal insides are breaking away from the plastic casing. Don’t get me wrong, I’m not putting out on the curb just yet. It still has quite a bit of life left in it, and you know I’m going to ride the machine until it can no longer stitch. 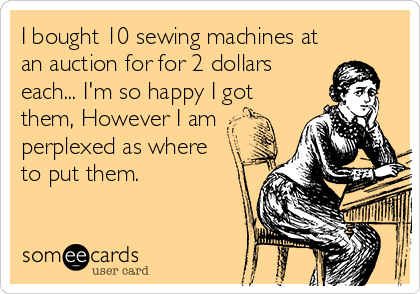 I do appreciate the 14 built in stitches, and at some point I have used all of them. That brings me to the only thing I do not like about my antique machines: they only do straight stitch. I adore everything else about them. the longer harps, and the speed at which they can run, and even just the ornateness that they were made with. I have lucked out though. The previous owners of both of my antique machines were very kind to them, and did take great care of them. However, I do have a sadder story to tell. Once upon a time, I received an old Viking, and the think was heavy and angry looking and I could not wait to sew on it. When I took off the plate to clean it and oil it before I started, I saw that it had rusted itself in place. Oh! I was so sad. I took it to a local sewing machine shop and asked if he would want it for spare parts. He did, and now I’m sure it lives on somewhere out there! I’m just happy to not have it sitting alone in my garage. Speaking of machines not being alone, I know a lady who told me the other day that she has over 20 machines piled up in her house! I also know, she uses all of them! Some may call it excessive, but in the land of quilting, I think we call it normal. I asked her how she accumulated so many machines. Her response was that she ‘saved’ a few, and some where given to her, and she bought plenty of them. For quite a long time she had an APQS Millennium in her living room. Personally, I cannot think of a better place for it! All in all, I guess I could see myself growing to some day hoard machines. I just don’t want to end up with a bunch of broken ones beyond repair. If I’m going to hoard them, they are going to work. I’m going to need them all to pull their own weight in this house! I feel like now I will always have a combination of antique and new machines. Someday I’ll come up with a sewing machine wish list for everyone to see, but until then, just know I’m always on the lookout for a Featherweight! I have many machines…hanging my head in shame, and I use most of them. Featherweight singer 221 is a must. I would include a 301, 15, and 99 on that list of must have machines. If you use them, then there is no shame! Old machines do not only do straight stitch! I have some that use cams and do wonderful decorative stitches. An orphaned singer from the sixties followed me home from work recently. It needs a good bath and delouse and then it might be up for rehoming. I do zigzag (but seldom the other fancy stitches) on a late 1940’s Necchi BU and an early 1950’s Necchi BU. I use them as treadles and they work great. They are class 15 machines so they also have plenty of bobbin thread. There are older machines out there that do more stitches.